France’s CMA CGM has this week announced that passenger cabins can now be booked on board its massive container ship CMA CGM Marco Polo (16,020 TEUs). These unique cruises offer travellers the opportunity to live a unique experience, discovering oceans, seas and continents in the pursuance of foreign trade, and getting involved in life on board, sharing in the crew’s everyday life at sea. The CMA CGM Marco Polo has five modern double cabins of 200 sq ft each, a lounge with televison equipment, library, fitness room and even a swimming pool. Sister ships CMA CGM Jacques Cartier and CMA CGM Alexander von Humboldt are under construction. CMA CGM Marco Polo is deployed on the world’s busiest trade route, linking Europe and Asia, and allows travellers to discover the world’s largest ports on the following rotation: Southampton, Hamburg, Bremerhaven, Rotterdam, Zeebrugge, Le Havre, Malta, Khor Fakkan, Jebel Ali, Ningbo, Shanghai, Xiamen, Hong Kong, Chiwan, Yantian, Port Kelang, Tanger and Southampton. Sample fares are €8,470 per person for the full 77-day round voyage (€10,010 for sole use of a cabin); Southampton to Hong Kong, 49 days at €5,39 per person (€6,370 sole use); Le Havre to Hong Kong, 41 days at €4,570 per person (€5,330 sole use); Hong Kong to Southampton, 28 days at €3,080 per person (€3,640 sole use); or Port Kelang to Southampton, 22 days at €2,420 per person (€2,860 sole use), or for a sampler Southampton to Malta, 14 days at €1,540 per person (€1,820 sole use). Slightly lower fares are available on other ships. Freighter cruises have been offered by the CMA CGM Group since 2000 and it now provides almost 600 passenger berths on seventy of its company-owned ships on Worldwide Routes (click to see detailed breakdown). For bookings and further information please call Miri Lopusna at The Cruise People Ltd in London on 020 7723 2450 or e-mail cruise@cruisepeople.co.uk. SeaDream Yacht Club win the Cruise Examiner YouTube award for 2013 with 1,014 views per berth. This week, we bring you the results of the 1st Annual Cruise Examiner YouTube Survey. With most cruise lines now having YouTube accounts, we felt it was time to compare how they are doing. The big winner is SeaDream Yacht Club, with a high score of 1,040 YouTube views for every lower berth in their two-ship fleet. Other high performers include Azamara Club Cruises, with 229 views per berth, and Cunard and Disney, with 224 and 223 views each, while at the bottom of the league is Crystal Cruises with just seven. With the arrival of the powerless Carnival Triumph at Mobile last week, we compare her situation to that of Carnival Splendor just over two years ago. We have up to date information on Cruise & Maritime Voyages’ Australian positioning voyages and look at how Facebook shares now compare with Norwegian Cruise Line shares since last week, when they were both at around $28. Shopping with the Chef – you can join the chef for his shopping! Each ship offers a choice of dining venues to suit your mood of the moment. No matter where you dine, you will find award-winning cuisine, attentive service and standards of excellence rivalling the finest restaurants around the globe. You can dine in their suite or on your veranda, with Seabourn’s compliments. On Seabourn, there is never an extra charge for any dining choice, something that is not true on all luxury lines. Generous seating in the dining venues means Seabourn guests have the true privilege of choice for every meal. Most restaurants are open-seating, inviting guests to dine where, when and with whom they wish. Complimentary fine wines with lunch and dinner. Open bars available throughout the ship, and guests’ in-suite bars stocked with their preferences. A beautiful open seating venue where guests are seated as they wish by a Maître d’Hotel. A broad menu of delectable choices is prepared to order by talented chefs. Open for breakfast, lunch and dinner; reservations not required. Restaurant 2 is open for dinner only, by reservation. Popular, more casual options for lavish buffet-style breakfasts and lunches, enjoyed indoors or overlooking the sea. Hot and cold dishes are prepared to order. The Veranda Café is available aboard Seabourn Pride, Seabourn Spirit and Seabourn Legend. On Seabourn Odyssey, Seabourn Sojourn and Seabourn Quest (above), The Colonnade offers nightly themed dinners, with service indoors and out. The perfect place for a casual lunch where chefs serve up casual fare, al fresco. The Sky Grill is offered on Seabourn Pride, Seabourn Spirit and Seabourn Legend. The poolside Patio Grill is aboard Seabourn Odyssey, Seabourn Sojourn and Seabourn Quest, and serves freshly-baked pizza all afternoon. Seabourn guests may order a meal from The Restaurant menu and have it served in their suite or on their veranda. The meal can be served course by course, with white linens, fine china and silver settings. As are all dining experiences, this option is complimentary. New Media: The Big (And Little) Cruise Lines – SeaDream Wins the YouTube Competition – But Do YouTube Viewings Generate Bookings? 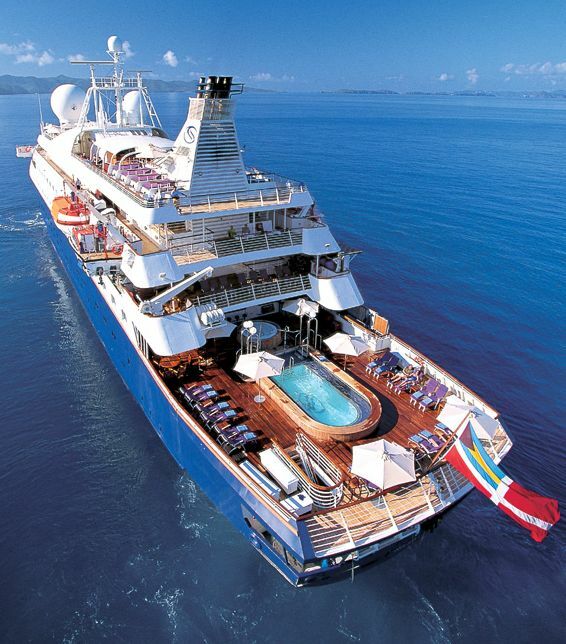 Aside from the big numbers up top, the most notable of all these entries is SeaDream Yacht Club, which is punching way above its weight with over 1,000 views for every berth it has in its two-ship fleet. Compare this with only 7.5 views for every lower berth on Crystal and you will see what we mean. But do YouTube viewings generate bookings? The question is probably of the same relevance today as asking if colour magazine advertisements generated business in their time (which is now largely past). Where Twitter and Facebook are probably not very productive, Blogs and YouTube videos are capable of conveying some of the actual experience of these products. Many of these videos can be found on our Cruise Lines Video Links Page. 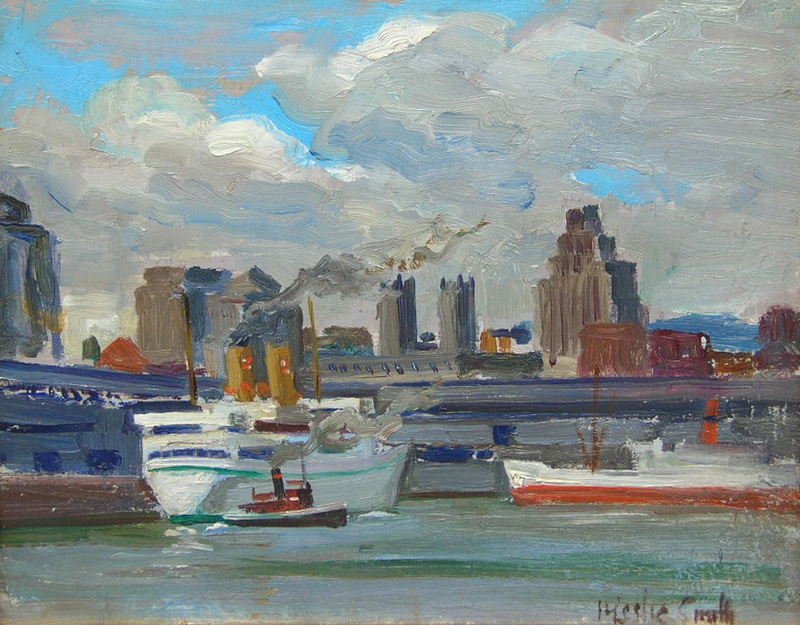 A small 8 x 10″ oil painting by Canadian artist Harry Leslie Smith (1900-74) of Canadian Pacific’s second Empress of Canada at her berth in Montreal sold today on eBay for $419. The starting price was $9.99 and the painting attracted 43 bids. This was the ship in which I emigrated from England to Canada at the age of four, along with my parents and younger brother. I remember to this day my father holding my head out the porthole and telling me that this was our new land – and seeing the bleak, grey, rocky coast of Labrador in late October! Coming back to the UK for good in 1992, the result of that voyage today is a London-based company called The Cruise People Ltd, which I formed to be able to allow the public to book the voyages that they wanted. We don’t just do cruises, our customers have sailed Round Antarctica, to the North Pole in Russian nuclear icebreakers, up the Amazon to Peru, to Australia in container ships, across the Northwest Passage in ice class expedition ships, across the Atlantic in tall ships – just ask and we’ll see what we can do for you, including the ultimate in luxury. Along the way, in 1998, I managed to obtain a larger oil painting of the Empress of Canada by American artist Lawrence Blumenthal that today hangs in my office in London and shows her departing from Liverpool on one of her regular voyages to Montreal. This painting is joined by a Blumenthal miniature in oils of Cunard Line’s Carinthia, in which ship I returned to England at the age of eleven to spend a summer in North Devon. For your own voyage of choice please call us on 020 7723 2450 or e-mail cruise@cruisepeople.co.uk and we will do our utmost to find what you are looking for, and if we can’t we’ll do our best to make alternative suggestions. By Kevin Griffin, London, 12th February 2013.